A client portal is a secure digital gateway to an organization's network, community, files, or other information. Client portals are often shared between an organization and their customers and can be accessed via a Web browser or mobile app. A client portal, like a customer portal, is provided by a company, built with client portal software, which gives clients the ability to securely login and access information, files, and services online. 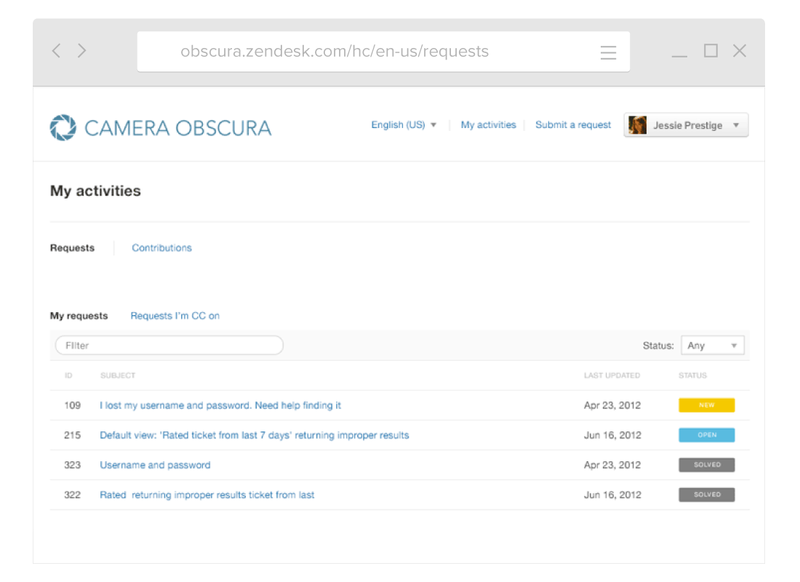 Zendesk Guide gives your customers access to everything they need, including a client portal and other self-service options, in a single location. In the early days of the internet, email was the main line of communication between a company and its customers. While this can be an effective tool for outreach efforts, it doesn’t give customers quick access to the things they want, like status updates to open customer service tickets or account information. So if a customer needs this information, they must reach out to the company, ultimately taking account executives and customer service agents away from other work. Many companies now employ a client portal solution, something that puts the power into the customer’s hands. Now they have the ability to login anytime they want and get access to things they need without having to reach out directly to the company. On-demand information. Rather than reaching out to a company on phone or chat for a real-time conversation, or sending an email or web form and waiting for a response, customers can simply log in and find what they need. Less strain on the company. Although customer inquiries can often lead to opportunities for engagement, it’s unrealistic to think that any customer service department can effectively handle an overly high-volume of questions without greatly reducing customer satisfaction. One way to mitigate this risk is to provide a secure client portal. Building an effective one with client portal software will prevent a large number of customers, who just want things like status updates to a customer service ticket, from directly reaching out to the company. Security. Features like encryption allow a user to safely upload and access important information (such as a document with sensitive information). Greater flexibility. Client portals offer far more features and capabilities than email, including higher limits on file size and access to account information. Many companies, particularly B2B, rely on long-term relationship management with their customers. Over time, customers will increasingly need to access information or upload personal information (such as a private document). Companies that want to avoid churn must learn to provide their customers with excellent experiences. Offering customers a client portal is an important step towards building a satisfying self-service experience for customers, while also improving transparency and freeing customer service agents to work on more difficult issues. Zendesk's help center gives your customers access to everything they need, including a client portal and other self-service options, in a single location. Clicking on “My Activities” shows them their entire support history, including the status of open tickets. Now customers can stay up-to-date on the progress of their tickets anytime, and even search for ways to answer their own questions, all from a single, organized location. There’s plenty of information about secure client portals and self-service options. Read these resources to learn more.